Do you shop at Kroger or one of its many subsidiaries throughout the United States (Fred Meyer, Fry’s, Harris Teeter, Ralphs, King Soopers, Dillons, City Market, QFC, Roundy’s, Smiths, Baker’s, Gerbes, Food4Less, JayC, Owen’s, etc.)? If you do, you can support our ministry without paying one penny out of your own pocket. How does this work? It’s simple. 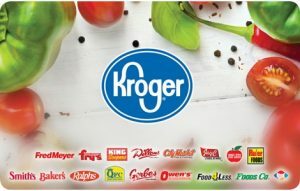 We will send you a Kroger gift-card which is valid at Kroger and its subsidiaries. Then, you can recharge it as often as you wish and use it for your grocery shopping, prescriptions, fuel purchases, etc. The exciting part is that every time you recharge that gift card, 5 percent of your purchase will be donated to our ministry without adding to the cost of your purchases! Can I still use my Kroger Plus Card/Rewards Card? Yes! Will I still receive my fuel points? Yes! Will my purchases cost more? No! How often can I refill my gift card? As often as you want. Ideally, each time you make a purchase at a participating store. Where do I reload my gift cards? Can my church or business use these gift cards? Yes! To begin, simply fill out and submit the form below. We will mail you a gift card to get you started. Thank you for your support.